We have had a long relationship with U.S. Cellular. Up until recently, they had been our only cell phone provider. Ever. We were always happy with them. When it was time to upgrade our phones, we usually got better deals as current customers then they were giving to the new customers. Customer service was always great, both in the store and on the phone when we needed something. 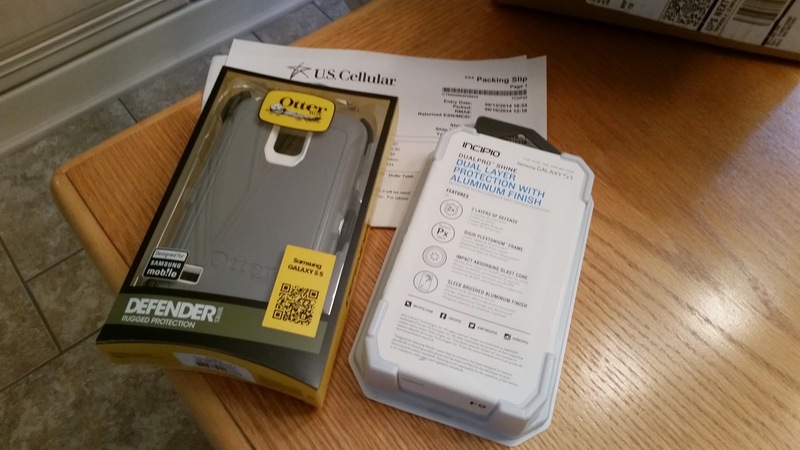 I even worked with U.S. Cellular last year as part of the U.S. Celular Better Moments Blogger Brigade, sharing my experiences and opinions of U.S. Cellular. But then we moved to Indiana, where there is NO U.S. Cellular coverage. I continued to use my U.S. Cellular phone for a while, and it worked fine, but apparently more than 50% of your usage needs to be in a U.S. Cellular coverage area. At least 50% of your monthly voice usage for each device on your account must be used in U.S. Cellular's licensed markets. No more than 200 MB of your data usage in any month for each device on your account may be used in U.S. Cellular's non-licensed markets. So, when my contract was up in May, we switched to another provider. Cory and I both got a new Samsung Galaxy S5, and we decided to use some of our U.S. Cellular Belief Points to order new cases for our new phones - before completely canceling the U.S. Cellular account. We earned them; we might as well use them, right? The day after we got our new phones, Jeffrey got a call from U.S. Cellular because we had ported our numbers to the new provider. They wanted to know if he wanted to change the plan - from a family plan to a single line plan, because his phone was the only one still active. He told them No, we were going to have to cancel the entire account; we were just waiting for our Rewards order to come. The customer service representative he talked to seemed very friendly and understanding. Then we waited. And waited. I kept checking the status of our Rewards order, but nothing seemed to change. In the meantime, our current billing period came to an end, and a new one started. We were halfway through the next month, no one was using the U.S. Cellular account (Jeffrey's phone was still on it, but he hasn't used it since we moved here because he has a company phone. It should have been canceled ages ago), but a payment would be due very soon. At this point, Jeffrey called customer service several times. First he was told the cases we ordered were out of stock, even though the web page still showed them in stock, and we had been able to order them. He was told that if we canceled our U.S. Cellular account now, to avoid further charges, that the Rewards order would be canceled too. A few days later, he tried calling again to see if we could perhaps order a different color case or something - anything to get the order shipped so we could go ahead and cancel the account. This time he was told, not that the items were out of stock, but that the order had been set aside because we ordered cases for the Galaxy S5, and we did not have any of those phones on our account. Which, in a way, is very nice of them - except that they didn't call, email, or otherwise contact us to see if we did indeed mean to order those particular cases. They just did not ship our order. So, the person Jeffrey talked to that night promised to send them out right away, and we would have them by the end of the week. Only the end of the week came, and still no cases. So he called, again, and got some other story. This time they told him that our order got held up because the computer couldn't make sense of our account. We had a family plan, but there was only one phone line on the plan. So the order just got - lost? ignored? - something. He was promised that we would have our order by the end of the following business day. Guess what? Nothing! At that point, Jeffrey called again, told the supervisor he asked for to just cancel our account, effective at the end of our last billing cycle, because the only reason the account hadn't already been canceled then was that we were waiting on this order. A couple of phone cases - paid for with Points that we had earned by being long-term U.S. Cellular customers - worth about $80 retail, just weren't worth the headache and hassle, and paying for an extra month of service that we weren't using anyway - which would have cost us more than the value of the phone cases. It just felt like they were dragging their feet, stalling, and doing whatever it took to keep from sending us our order - and keeping our account open. So the account was closed that night. They had been shipped the night before. Why did it have to take almost a month? And multiple phone calls? Either they are just extremely incompetent - and the term 'customer service' is a joke - or they were taking it very badly that we had to leave them - even though it had been explained to them multiple times that we were only changing providers because they do not offer service in this area.